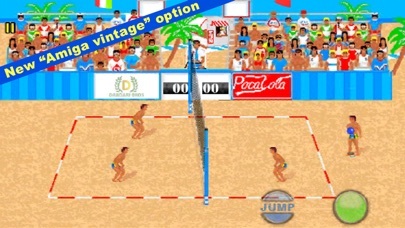 "Over The Net Beach Volley” is the arcade video-game of the most played summer game in all the beaches of the world. You'll be able to take part in enjoyable and frantic tournaments on the most famous beaches, Miami, Barcelona, Dubai, Montecarlo and many others. 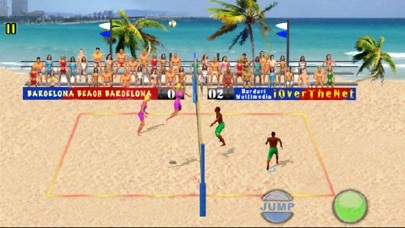 - "Single game" mode: you can choose your own team among 11 possibilities and one out of 4 beaches. - "World tour": after you have chosen your team, you start a world competition in 8 different beaches playing with stronger and stronger teams. - 2 different kinds of serve. : normal or "jump serve"
- Spike: during the jump, spikes are performed by swiping your finger. Your movement determines the strength and direction of the ball. Extremely strong attacks may disorienting the adversary when hit thus increasing the spectacularity of the actions. Look at the tutorial in the support page!